Sleep is an important nightly ritual for everyone on this earth, but life represents movement and change, adventures and challenges, and sometimes life takes us away from home. We can't always stay at the closest Motel when we are living on-the-go lifestyles and most people find discomfort in sleeping on the floor all night. Manufacturers know life takes us to many places, and they have patented some amazing air mattresses to provide us comfort no matter where we go. 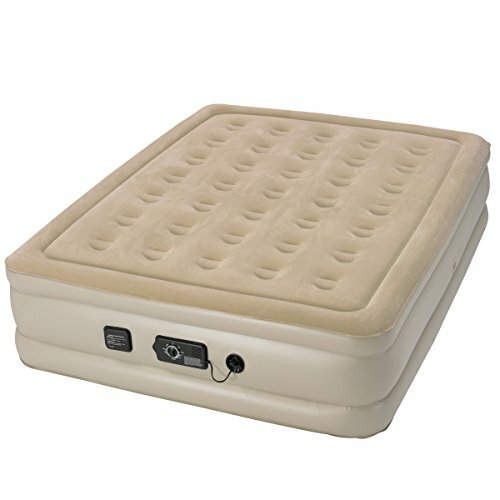 We would like to share with you the best air mattress we found on the market today. 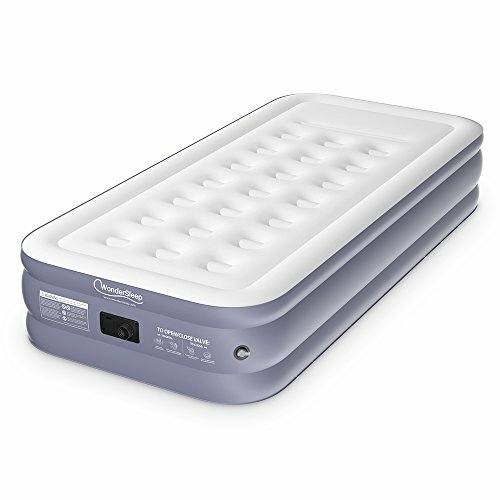 Air mattresses offer comfortability and portabilit y for much lower prices than a normal mattress and one can use them for a multitude of situations. Some people are constantly traveling and need a bed they can fold up, unfold, and inflate when need be, some people want simple solutions for guests, and some people want space-saving options for small living rooms or bedrooms. No matter your reasoning for purchasing an air mattress, there is a low price out there with all the specs you desire just waiting for you to discover it! We found a few of the most frequently asked questions from curious customers looking into buying air mattresses. 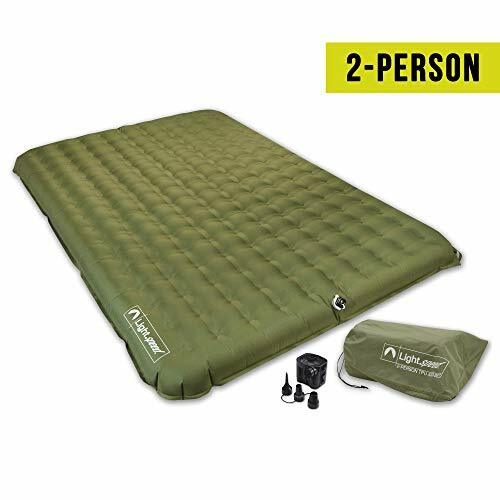 Our purpose for sharing this list with you is to shed light on the aspects of picking out an air mattress and knowing what use cases it will solve for in your life. 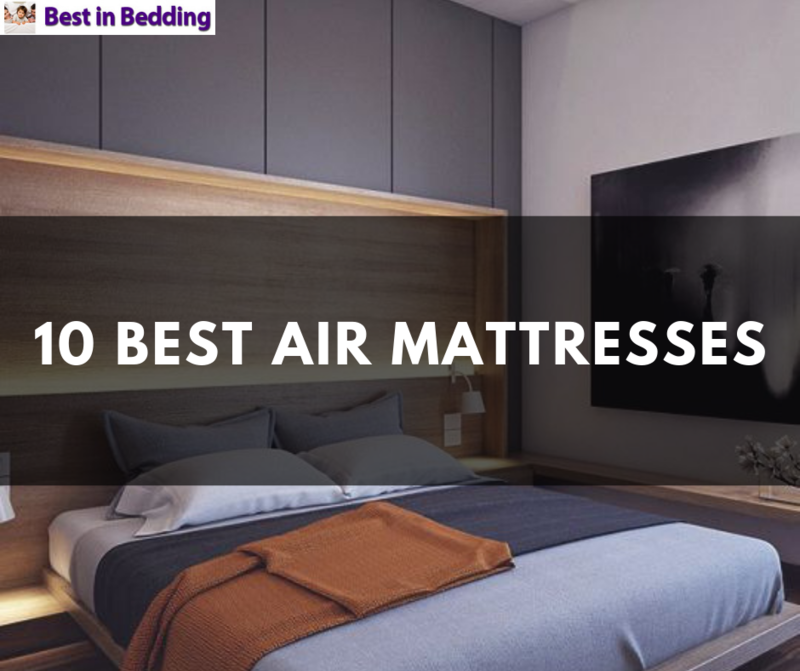 We hope this list answers a few of the questions you may have and will help you find the absolute best air mattress out there for your needs at the lowest price! Why Would I Consider An Air Mattress? There are many reasons one may consider buying an air mattress. Those who want a space-saving option for smaller living arrangements will benefit from the ability to easily move the mattress, deflate and inflate it as needed, and fold it up when they are not using it. Those who want a simple solution for guest rooms but do not want to invest hundreds of dollars on a mattress that will only get occasional use will also find relief in the air mattress option. Those who live on-the-go lives who are constantly moving from place to place may not want a real mattress because of the difficulty of moving it with them. Inflatable mattresses offer portability at a much cheaper cost that will give peace of mind to those that are always on the move. Since there are different use cases that the best air mattresses may fulfill, there are different types out there to meet these needs. Basic, solid mattresses without all the bells and whistles are excellent for guest rooms to offer those who stay over maximum comfort at a low price. 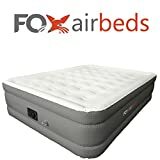 Memory foam air mattresses can offer extra comfort for those who will miss a solid mattress and raised insta-beds are wonderful for holding up under daily use. 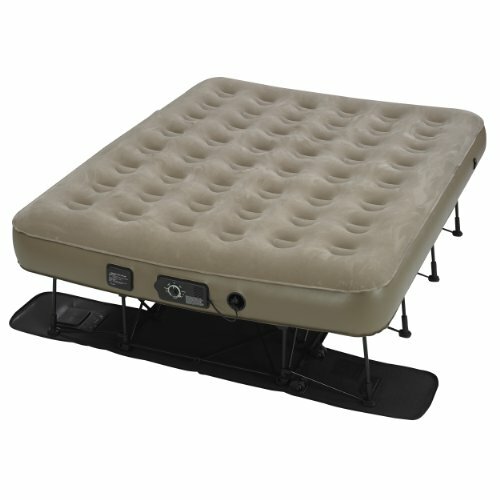 Airbed cots are ideal for camping or backpacking and there are even mattresses made for fitting inside your car or SUV! There are blow-up mattresses, raised mattresses, convertible air beds, and self-inflatable mattresses. Buying Tips For The Best Air Mattresses? 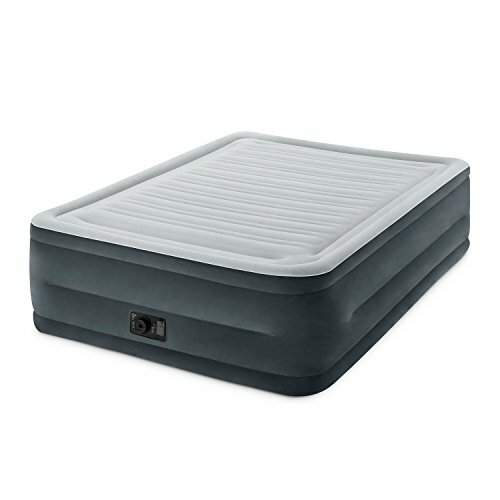 Before beginning the search for the best air mattress you can find, there are several specifications you should consider. You should know what kind of mattress you would enjoy the most. Your choices are blow-up for occasional use, raised for a comfortable traditional mattress feel, convertible to serve as a piece of furniture and self-inflatable for ultimate convenience. Aspects such as comfort level (which depends on the thickness of the mattress) size (twin, king, or queen), added durability for the claws of our furry friends, the ease of use (manual pump, automatic, or self-inflating), its ability to hold air in over time, and the warranty are also all important to consider before buying, as well as the price. Air mattresses are available in stores that specialize in bedding and other furniture items, and the most basic and cheap models are available at places like Walmart and Target. Online shops are becoming increasingly popular because of their countless brands, competitive pricing, and keyword searches to help one find exactly what they want for the lowest price. 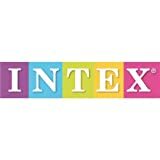 Places like Amazon and eBay are excellent to look into because they have product specs listed by the manufacturer and a multitude of customer reviews one can read before buying. Most inflatable mattresses are right around the $50 - 100 range, but the best air mattresses on the market built for durability and everyday use may be up to multiple hundreds of dollars. It is a case of getting what one pays for, but the options are far more affordable than regular mattresses. We would like to recommend Amazon for the best prices, best product variety, and helpful customer reviews. We will have links for each air mattress we suggest and we encourage you to check out those links for yourself! This mattress is perfect for the guest room in your house. 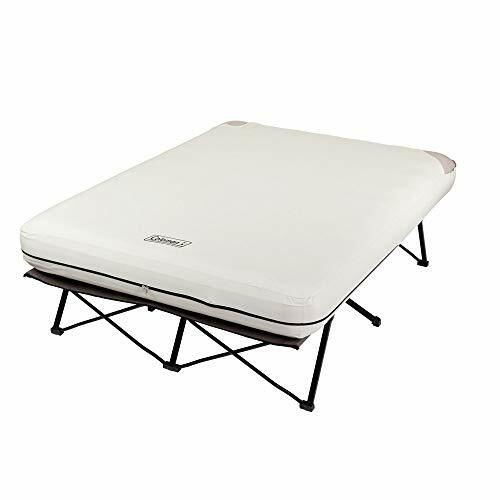 This minimalistic, basic mattress is solidly built and performs its functions well. One can rely on a mattress like this one for years to come. There are 40 internal air coils to help improve support, durability, and substantiality. The internal pump works at the simple push of a button and it only takes about four minutes for the mattress to inflate to the optimal size. 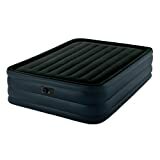 This air bed comes with a memory foam top above the air chamber to make it feel more substantial like a normal mattress. This air bed comes with two pillows and a built-in two-way pump for inflation. There is also the option of inflating this bed from an external pump if you so desire. It comes in all sizes from twin XL to Cali King. It pleases users with the comfort, ease of inflation, and not bouncing when your sleeping partner moves. This mattress features a smart automatic double-pump system that inflates and deflates the mattress in three minutes. There are 35 circular coils within to create a firm structure with lots of support. This cot is the closest one can get to feeling like they are sleeping on a real bed. Its steel frame supports up to 600 pounds and is long enough to accommodate anyone under 6 feet two inches tall. The 16-inch height of this bed has a built-in pump and is waterproof. It will hold up to 600 pounds and is easy and quick to inflate. The top chamber helps one add a fitted sheet with ease. This bed sits on a frame and is 11.5 inches thick. The included pump allows it to fill up in just four minutes. This is another great option for guests and many users revere this mattress for its comfort. This 22-inch thick mattress is one of the tallest on the market and is great for those who have trouble getting to floor level. It has a waterproof top and a built-in pump to fill it up within five minutes. 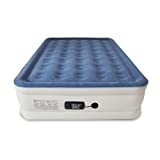 This air bed is made of thermoplastic polyurethane which is a polymer composed of many resistant microfibers designed to hold one in place all night every night. The battery-operated pump is easy to set up and operate and can be adjusted to the user's firmness specifications. Internally, this mattress boasts 192 individual connectors that hold the layers together at all times and give you the stability you need at night. This air mattress features a fast inflation and deflation dual pump, an array of air coils to help with the firmness and comfortability of the mattress, and a locked top for added comfort. 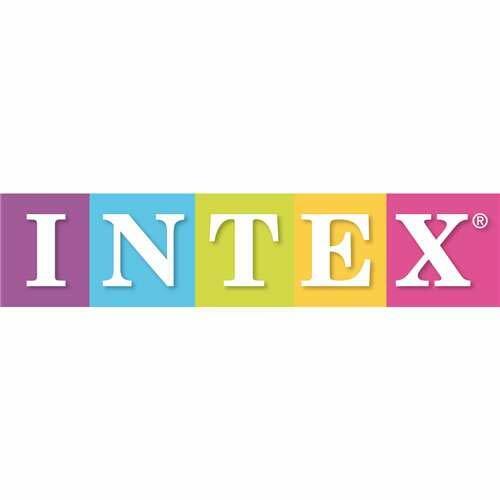 This mattress is the favorite of many who are looking for a mattress that has the ability to control the firmness, has a built-in fast-action pump, and will stay inflated throughout the night. This is another 22-inch thick mattress with a built-in pump for fast action less than five minutes of inflation time. Manufacturers designed the sides of this mattress to grip and hold sheets in place to add comfort to the sleeper. It is highly affordable and comes along with a carry bag for ease of transportation. There are so many convenient options out there for those who don't want to spend hundreds or thousands of dollars on a brand new standard mattress. Inflatable mattresses are amazing products for those who live the outdoor life, have limited space in their homes, or want to give their guests a comfortable night's sleep without breaking the bank. We hope our list has given you a few ideas and pointed you in the right direction to get you closer to finding and purchasing the best air mattress you can find on the market! Pick out your favorite from our carefully thought-out list and follow the Amazon link to order yours today!